Advertising, in its essence, is about reaching the largest number of people, in the most seamless, creative way. However, reaching a large audience can often be the biggest hurdle, so how does a crowd of a few hundred million users sound? Weibo, China’s answer to Facebook, WhatsApp, Instagram and every other app combined, has hit the 340 million user mark, and China Social Solutions are their official agency Down Under. Based in Australia and housing a diverse team of 12, the agency has already earned the title of the global award winners for Weibo’s Best Innovative Agency 2017. The agency’s purpose is simple; they’re here to close the void for businesses looking to speak to people not being currently spoken to by brands. They’re a one-stop shop for clients looking to target the Chinese market through social media and offer copywriting, image production, ideation and activations, as well as a litany of other services. Specifically, China Social Solutions specialise in designing and customising comprehensive consumer journey maps on Weibo and WeChat; they’re an end-to-end solutions-based agency in every sense of the phrase. Clients of China Social Solutions can expect a team of certified experts, who specialise in Chinese social media advertising, applying their extensive knowledge in the performance and experience space of Chinese Social media to create incredible, multi-channel campaigns. The team can also offer graphic design and social content production, give authority on Weibo and WeChat platforms to gain strong brand exposure, access to premium ad units and betas and most importantly, provide unprecedented insights. This includes insights into both Chinese user behaviour in Australia, as well as industry insights focusing on Chinese consumption in Australia. China Social Solutions also take care of media planning and buying and can translate advertising at a professional level. So what have they already done? Well, quite a few things, actually. 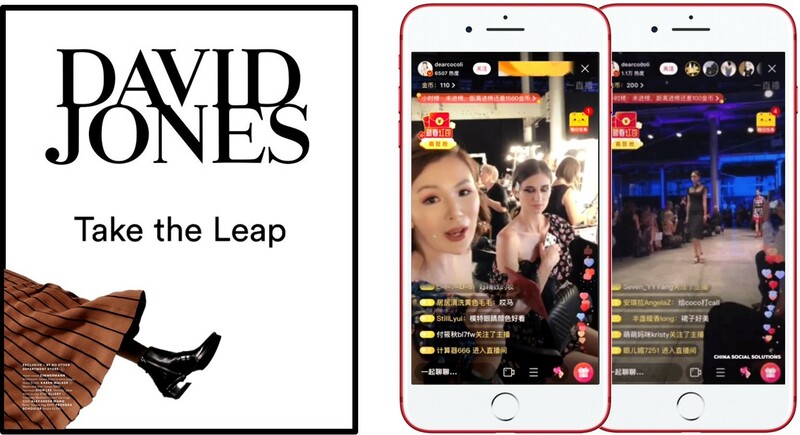 China Social Solutions has also engaged with fashion icon and Key Opinion Leader, Coco Li, to launch the first commercial runway Live Stream on Weibo in Australia for David Jones. On top of this, they reinvented the David Jones digital experience on WeChat by creating an online Chinese fashion catalogue. The WeChat fashion catalogue is a weekly publication which allows users to engage with snackable content and buy products directly from DJ’s online store in fewer clicks and has simplified the purchase process and improved the users shopping experience. Really, the most exciting thing about China Social Solutions is their status as an official Weibo agency in Australia and New Zealand. As a licensed and accredited Weibo agency, they offer an array of media inventory for their clients as part of their product set. Because of this, they have direct ties with the Weibo International team in Beijing and can access the latest products, betas, insights and ad units to help local and international brand innovate and elevate social campaigns. And overall, create an absolutely stellar campaign for their clients. So, if you want to better access a burgeoning market segment – and one that’s often overlooked – it might be time to check out China Social Solutions.